Motorhomes and RVs are designed to handle the toughest conditions nature can throw at it, but only for a few months out of the year. Leaving these vehicles sitting out in the constant rhythm of scorching sun, beating rain, and freezing ice or snow will only cause them to look aged and develop serious leaks and cracks. Exposure to the weather causes corrosion, leaving it difficult to open the windows or extend your pop-up sections. Metal motorhome covers prevent all of these problems and more. Choosing one of our fully enclosed steel motorhome covers adds an extra layer of security if you’re concerned about vandalism or theft, especially when leaving your RV parked hundreds of miles away from your home. One of the best reasons to install one of our metal motorhome covers is to enjoy the permanent reduction in maintenance on your motorhome. Tarps and canvas covers can only block so much of the sun’s damaging UV rays, but our steel paneling blocks 100% of UV exposure that is so hard on the rubber roofing used on motorhomes. Keeping the sun off the roof results in a total lack of leaks without the need for costly recoating procedures every few years. One leak can entirely ruin a motorhome, so weigh the cost of motorhome covers versus the cost of a full replacement that your RV insurance may not cover. Beyond just a newer looking exterior and reduced roof maintenance, protecting your motorhome from the weather can prevent a lot of other serious problems. Enclosed motorhome covers are easily heated in cold climates where freezing damage is a concern. It’s also easy to winterize an RV when it’s parked under at least an open cover. Snowfall and falling branches are a major hazard for RVs and campers of all sizes. Many people are interested in downsizing during retirement or while working from home, and moving into a motorhome is often a perfect way to save on rent while still enjoying a comfortable lifestyle. If you prefer a fixed location to the traveling style of RV living, enclosed metal motorhome covers transform your living space and greatly expand it. 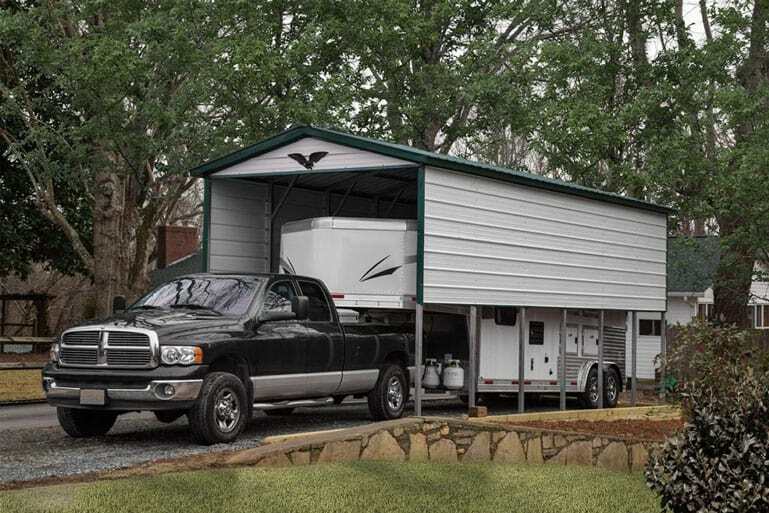 You can add entire rooms to your RV, not to mention covered porches thanks to our lean-to expansion options. A little extra work to finish in the space and you have a spacious home that is ready to last for decades with as little maintenance as you’d do on any other home. Since every motorhome enthusiast is different in how they prefer to enjoy their home away from home, we’ve made our steel motorhome as customizable as possible. Mix and match features like over a dozen exterior color choices, heavier frame material to resist snow loads and strong winds, bay and regular doors in any number and configuration, and much more. We pride ourselves here at MetalCarports.com for meeting every customer’s unique needs in motorhome covers, so we’re sure we can make you happy with one of our designs.